View More In Snow Blower Tire Chains. * As the weather gets worse and we approaching the heavy snow storm season, you need to prepare yourself for the unexpected with the anti slip Snow Traction Mat. * The mats are all year, all weather use, can be used winter in the snow, and Summer in the mud, If you use it once, you'll never travel without it. * This car escaper provides emergency traction for your auto tires, gets the car out of snow, ice, mud or sand. 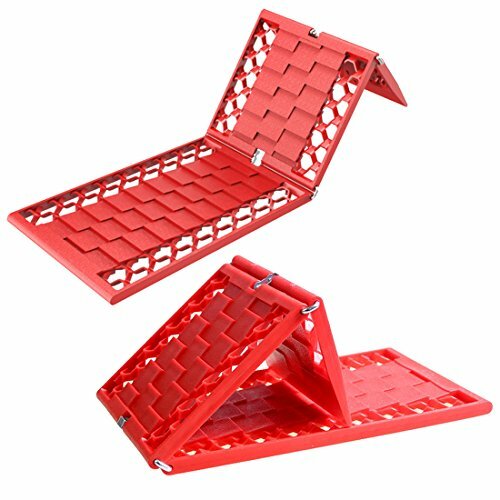 It is designed with hexagonal honeycomb for superior traction and increasing friction. 1. Effective usage, please clear the snow, sand, clay and other obstructions near the tires. 2. When using, please make sure to clamp the product between the tire and ground. 3. Adjust the product towards direction of the rolling tires. Dimensions (Each): 22 inches (L) x 7 inches (W) x 1/2 inches (H). Provides emergency traction for your auto tires, gets the car out of snow, ice, mud or sand. With adjustable angel, situable for various roadway. If you have any questions about this product by WawaAuto, contact us by completing and submitting the form below. If you are looking for a specif part number, please include it with your message.